Low latitude F region ion motions exhibit strong seasonal and solar cycle dependences. The pre-reversal enhancement (PRE) in the vertical ion drifts is a particularly well-known low latitude electrodynamic feature, exhibited as a sharp upward spike in the velocity shortly after local sunset, which remains poorly understood theoretically. The PRE has been successfully simulated for the first time by a general circulation model, the National Center for Atmospheric Research thermosphere/ionosphere/electrodynamic general circulation model (TIEGCM). The TIEGCM reproduces the zonal and vertical plasma drifts for equinox, June, and December for low, medium, and high solar activity. The crucial parameter in the model to produce the PRE is the nighttime E region electron densities: densities ≥ 104 cm−3 preclude the PRE development by short-circuiting the F region dynamo. The E region semidiurnal 2,2 tidal wave largely determines the magnitude and phase of the daytime F region drifts. 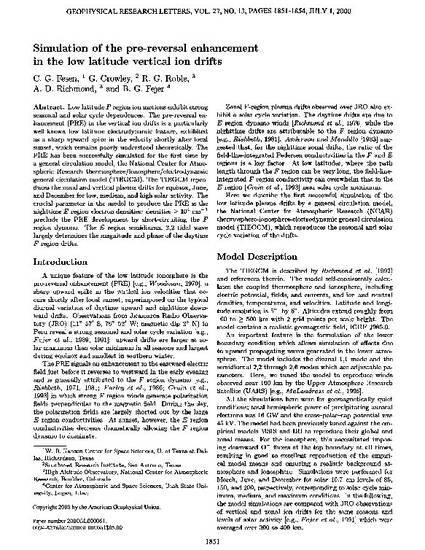 Fesen, C. G., R. G. Roble, A. D. Richmond, G. Crowley, and B. G. Fejer, Simulation of the prereversal enhancement in the low latitude vertical drifts, Geophys. Res. Lett., 27, 1851, 2000.